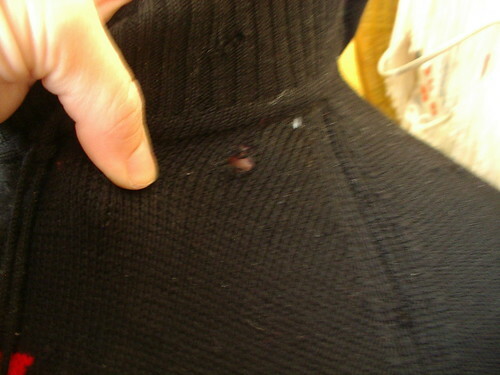 [google6a7b7d93c7100df5.html] Sunshine's Creations.Vintage Threads Inc.com: Help with damaged old sweater ? 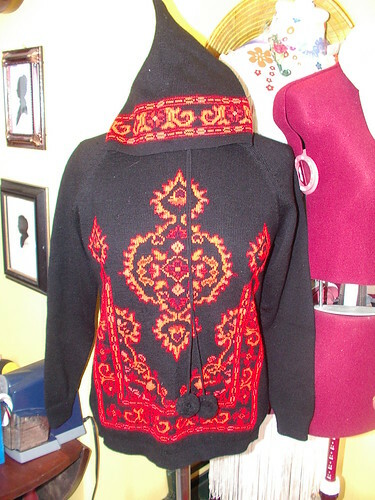 I was given this sweater over four years ago from my Vavo it is a beautiful sweater that has hung in her closet since 1967 that is a number of years to never be worn still has the original tags on it. 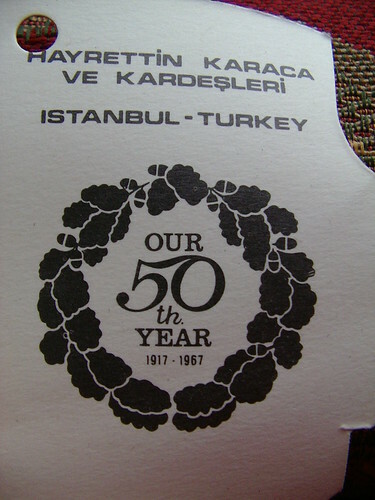 In 7 years this sweater would have had its own 50th anniversary made by Çift Geyik Karaca. I think the companies name means "two light brown deer" but not sure. She lets us go shopping every now and again in her closet to get one item from her. Sad thing is at some point in her closet she had wool moths so before I ever saw it this damage was done. I kept in in the hopes I could repair it some day and wear it. I tried mending it but after 12 hours of fixing holes I wasn't even 1/10 the way done. Secondly who ever made it made the neck hole so small it is impossible to wear the body part fits me but the head part is painful to put on it won't even go over my 8 year old's head with out pain. I can't bear to toss it as it is beautiful and has been around for so long with out ever having been used. I thought of felting but didn't know if that was like sacrilegious so to speak. If it ends up felted I will copy the image from it to graph paper. 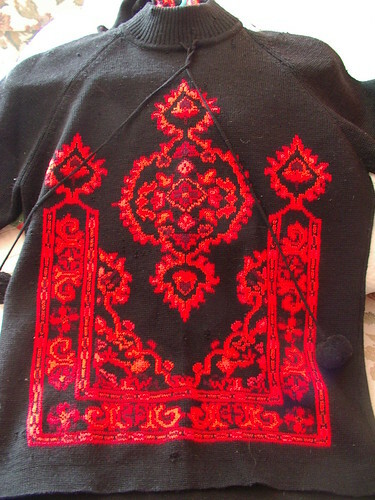 The image was hand embroidered with wool after it it was knit so tons of hand work. I would probably want to just knit the pattern in instead. 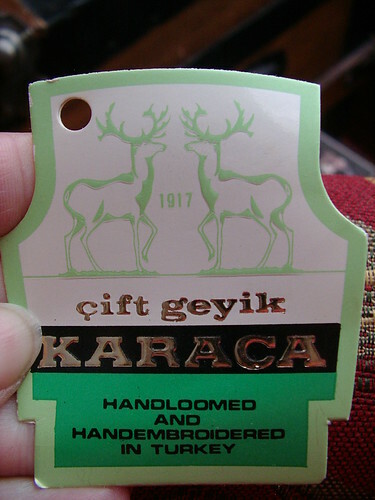 This was made in Turkey and is 100% wool. The reason I know ruffly its age is well because it was a commemorative sweater and there is a date inside on the tag, one more reason not to toss it. It has buttons that hold on the hood. 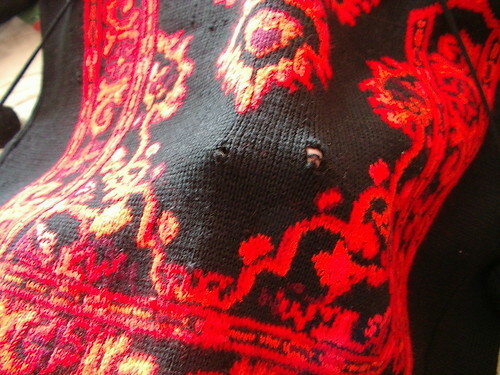 Can I just say putting on such tight neck with buttons around the neck over the head it is a wounder that my girls and I do not have cuts all over our faces. As it scraped past all our faces it was painful to say the least. 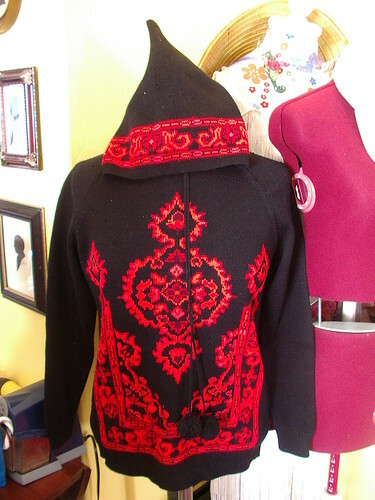 What was that knitter thinking oh yeah wasn't I bet that is why my grandmother never wore it bought it on a trip tried it on after getting it home and that was the result to stay in the closet. 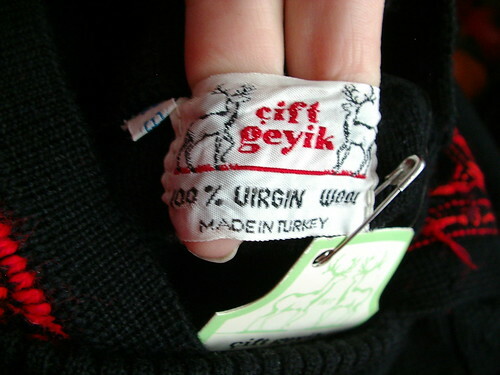 I was so hoping I would get to wear this sweater but I don't think that is going to happen at least not in this form. I thought about felting it and making a skirt from it for me or one of my daughters, or a hat and mittens I don't know yet what will become of it, any ideas? The pompoms you see in some of these photos fell off right after the photos because the moth holes in the cords where so big just moving it around broke them off. They had been just decorative anyway they didn't actually cinch anything they just hung there as decoration to be tied but do nothing. There are way more holes then are shown in these photos I stopped counting when it got to be over 100. Figured it would be easier to re-knit and embroider than to fix. And trust me I am not thinking of re-knitting just yet not sure I have that skill. Having made my husbands hat in black and trying to mend this in black my eyes hurt just from the thought. Sorry for the bad lighting in these photos. So any ideas! Love the jumper but can't imagine trying to repair all the holes! I just blogged yesterday at http://www.clasheenuncut.wordpress.com/ about upcycling my friend's jumper that shrunk by mistake in the washing machine and I am THRILLED with the result. You say that your top is wool (and the embroidery looks like wool too) so it should shrink very well in the machine if you put it in a couple of times at 60 degrees. The only slight problem might be that the embroidered areas might shrink a little differently but all the holes should almost disappear and you could line the bag anyway with some gorgeous hot red fabric. The sleeves could then be used for arm warmers or how about making a small purse to match the bag? Would love to see what you come up with but I say take the leap and felt away! 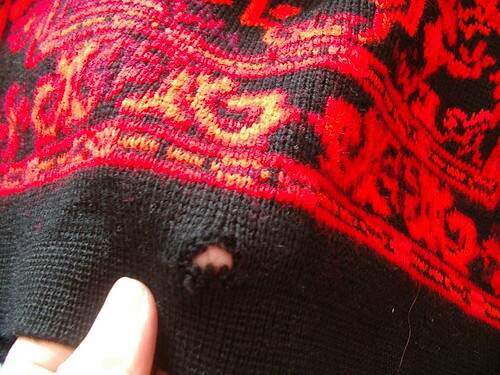 Are you still up to darning the rest of the holes? If you are how about turning it into a cardigan? 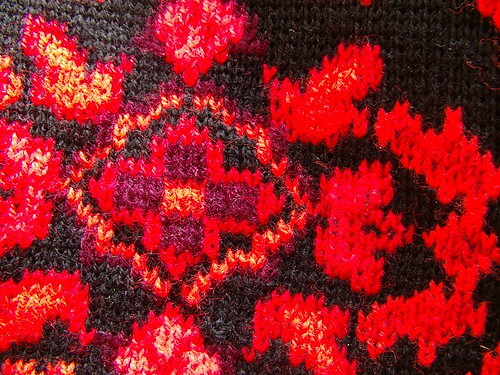 You could very carefully cut it down the middle and then add some of the beautiful crochet that you do for an edging. This would solve the tight neck problem. Just a thought.